Ideal for use with Electric Shaver, Epilator, Toothbrush only. Convert Your 2 Pin Plug Into A Three Pin UK Adapter. Universal Electric Shaver Adapter With UK Fused Plug. 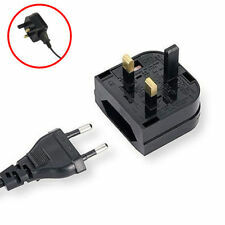 Universal USA EU to UK 3 Pin Travel Plug Adaptor Adapter Converter 13A 250V. Ideal for use with Electric Shaver, Epilator, Toothbrush only. Universal Electric Shaver Adapter with UK Fused Plug. You Will Receive 1 x Shaver Plug. Convert Your 2 Pin Plug into A Three Pin UK Adapter. 2 to 3 Pin UK shaver adapter. Output (jack) for: the UK/British standard jack, acceptable - UK/British standard three pin plug. We will try our best to resolve the issues. Hope you can understand. Go Travel Earthed America to UK Adaptor - USA Convertor - Adapter Condition is New with tags. Dispatched with Royal Mail 2nd Class (2 to 3 working days). This light weight especially designed cable keeper for mains hook up cables is suitable for lengths of cable up to 25m. Mains Hook Up Cable Storage Device & Bag £18.25. 3 pin port for storage of mains tester or cable plug. International Plug adaptor travel set. Two Pin Shaver / Toothbrush Adapter Electric / Three Pin Shaver Adapter. You Will Receive 1 x Shaver Plug. Universal Electric Shaver Adapter With UK Fused Plug. Ideal for use with Toothbrushes, Electric Shaver, Epilator. Universal Electric Shaver Adapter with UK Fused Plug. Ideal for use with Toothbrushes, Electric Shaver, Epilator. Convert 2-Pin Plug into a 3-Pin UK plug. Do not use with electronic devices demanding power over (230V-1840W, 110V-880W). Fit in the palm of your hand, small and lightweight, good choice for your travel. All in One Design International Travel USB Plug Adapter. The electric toothbrush only requires a 1A fuse, so this adapter is perfect. 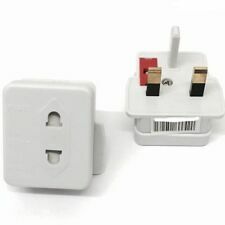 FITS SMALL ELECTRICAL DEVICES: This adaptor will NOT power any standard 2 pin devices, such as computers or kettles as it only has 1 amp fuse, so only suitable for small electrical devices such as shavers and tooth brushes. VGUARD Worldwide Travel Adapter, 4 USB Ports Universal Travel Adapter International Power Adapter Plug Adapter Converter UK USA EU AUS Asia China Ireland Thailand 150 Countries - Blue. VGUARD Travel Adapter, Perfect Worldwide Travel Charging Solution for Your Family or Friends Together! Universal Electric Shaver Adapter With UK Fused Plug. Ideal for use with Electric Shaver, Toothpaste Epilator Adapter Only. You Will Receive 1 x Shaver Plug. Universal Electric Shaver Adapter With UK Fused Plug. Ideal for use with Electric Shaver, Epilator, Toothbrush only. You Will Receive 10 x Shaver Plug. Convert Your 2 Pin Plug Into A Three Pin UK Adapter. Black EVA Protective Headphone / Earphones Carry Case And Cover W/ Netter Pocket. Black Water Resistant DVR Case For Edirol Roland R-05 DVR / aLLreli SPY DVR v8bob123(840). Aluminium Binocular Tripod for Celestron TRAILSEEKER 8X42 | SGODDE 16 x 52 kourosh8907(270). Shaver Adaptor Toothbrush Shaving Oral-B 2 Pin to 3 Pin UK 2 Pin To 3 Pin 1A Shaver / Toothbrush Adaptor Plug UK Shaving adaptor, allows a 2 pin shaver or 2 pin toothbrush charger to be used in a UK 3 pin socket. Will also work for other SMALL electrical devices that have a 2 pin shaver / European plug. CE certified and fitted with a 1A fuse High Quality Product. Two Pin Shaver / Toothbrush Adapter Electric / Three Pin Shaver Adapter. Universal Electric Shaver Adapter With Uk Fused Plug. Ideal for use with Toothbrushes, Electric Shaver, Epilator. COAX LEAD 2M WHITE / GOLD CONNECTORS & BACK TO BACK CONNECTOR SUPPLIED IN POLY BAG. Co-axial socket to socket adaptor to convert lead plug to a socket. Length 2 m.
Universal Electrical Plug Adapter Travel Power Socket Converter Outlet all in One Worldwide Use for US / UK / EU / AU Plug Portable. Perfect for Travel, Universal Electrical Plug Adapter all in one for US / UK / EU / AU. Ultra-Compact: USB port conveniently locate on the top of the plug, especially useful when using a plug at the bottom of a wall. Lightweight and small in its size, easy to put it in your bag for travel. You will receive 1x Shaver Adaptor Toothbrush Shaving Oral-B 2 Pin to 3 Pin plug UK 2 Pin To 3 Pin 1A Shaver / Toothbrush Adaptor Plug UK Shaving adaptor, allows a 2 pin shaver or 2 pin toothbrush charger to be used in a UK 3 pin socket. Will also work for other SMALL electrical devices that have a 2 pin shaver / European plug. CE certified and fitted with a 1A fuse High Quality Product. 1 x Intercontinental. 1 x Continental. B o t h I t e m s a r e B r a n d N e w.